One does not need to be a genius to solve the apparent mystery of the predictions of the Octopus called Paul, it’s enough if one realizes that there is no divination or fortune-telling in the physical or the spiritual plane. In other words, the future cannot be predicted, we can only speculate about it. Many animals like monkeys, horses, elephants, etc, were used as "fortune tellers", but in all these cases, no matter how remarkable the predictions were, it was merely chance or luck and nothing more than that. Interlocutor: Master, here I have scheduled something that is turning the heads to many people. I’m talking about the famous "Paul, the Octopus" ... What is the secret of his guesses? 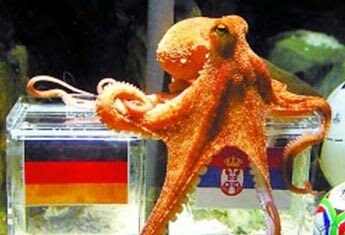 Paul, the Octopus was born in 2008 and it has been used as an oracle to predict the outcome of the games of the German national team in international competitions, concretely from the UEFA 2008 and the 2010 FIFA World Cup in South Africa. Interlocutor: Concretely then, all the guesses attributed to the octopus were simply chance, without any other explanation? Ruanel: Yes, everything was pure chance... In addition, it would be childish to imagine that any authority, alleging that the octopus is capable to foresee the future, offered the country that keep him a large sum of money to acquire it. Without considering that this kind of animal has a very limited life span. Interlocutor: Has it ever happened something like this with so much chance? Ruanel: It's like in the dice game called "Poker dice" and if you roll "five of a kind", which in some countries is called " generala”... It is a way to express it in this game...Or when you roll the dice three times "five of a kind” or that in the game you call roulette you get the same number three times and each time betting the same amount of money and three times that number would have been guessed... It can happen! Interlocutor: In particular, have these things happened in this 2010 World Cup? Interlocutor: Master, I think that this issue is clear enough, and if there is nothing more to say, we could end this topic now. This entry was posted at Sunday, August 01, 2010 and is filed under Mysteries and Enigmas . You can follow any responses to this entry through the .